refinish watch cases and bracelets. 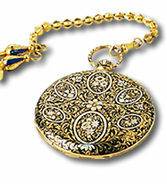 This involves removing scratches and dents from cases and bracelet and repairing worn hinges on pocketwatches. Once cleaned, steamed, hand buffed & dried, the bracelets & cases are returned to their original luster. In some cases, Universal can even remanufacture missing case parts (bezels and back covers) in stainless steel or gold. Universal also provides dial refinishing services when a dial is old, discolored or faded and a new dial is not available. This is a specialized skill and Universal uses the most talented laboratory in the world for this process.